Most people in the United States have never tasted Sichuan peppercorns. From 1968 to 2005 they couldn’t because it was illegal to import them into the U.S. Now Americans can enjoy Sichuan peppercorns and learn to roast them to bring out their flavor. Sichuan peppercorns also spelled Szechwan or Szechuan, are quite unique. They are incredibly aromatic and flavorful, but not hot. They have a numbing property, which in China is known as "ma," that produces a light tingling sensation in the mouth, somewhat resembling a mild dose of novocaine. 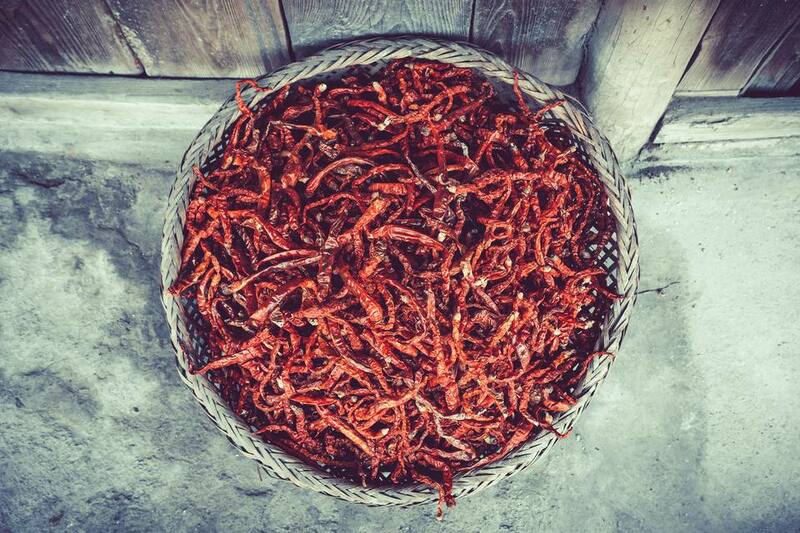 For most people, the biggest attraction of Sichuan peppers is their glorious fragrance. They have a lemony-pepper aroma (and flavor) that is quite pleasing. The flavor adds an almost summer-like quality to food. Sichuan pepper is a key ingredient in many traditional Chinese recipes. Sichuan pepper (xanthoxylum peperitum) is native to the Sichuan province of China and is not related to black pepper (peper nigrum) or chile pepper, which is native to India. In fact, Sichuan peppers aren’t really peppers at all. They are actually the dried out pods of woody shrubs. Before Asian cultures were introduced to chile pepper, Sichuan pepper was used along with ginger to give heat to many dishes. The heat in modern Sichuan cooking comes instead from red chile pepper (capsicum annum), which was introduced to Asia in the 15th century. Until very recently there was a long-standing ban on the importation of this pepper. The FDA banned the importation of Sichuan Peppercorns because they were carrying a citrus canker bacterial disease. This bacterial disease could potentially harm the foliage of citrus crops in the U.S (there was never any danger to humans). Recently the USDA and FDA have lifted the ban, provided the peppercorns are heated to around 160 degrees Fahrenheit (which kills the canker bacteria) before importation. This simple technique for roasting Sichuan peppercorns will add an interesting flavor to your meals. To roast Sichuan peppercorns yourself, you'll need the Sichuan peppercorns (1/3 cup is a good place to start), a small skillet or frying pan and a spice grinder. Shake peppercorns in a sieve to knock loose any dust that may be clinging to them. Spread on a small white plate and sort through, discarding any twigs, leaves, black seeds, or other unwanted material. Place Sichuan peppercorns in a frying pan over medium-low heat. Heat peppercorns, shaking pan occasionally until they begin to darken and become fragrant. When cooled, grind peppercorns with a spice grinder, mortar and pestle, or crush them with a rolling pin. Use as called for in a recipe, or store in a covered jar until needed. Instead of grinding the peppercorns after roasting, you can store them in a covered jar and grind when needed. The length of time it takes to roast the peppercorns will depend on the amount you are roasting. It is important not to let them burn. When you're finished, roast some kosher salt to be served alongside the roasted peppercorns. Try using your roasted peppercorns to make homemade Szechuan peppercorn salt.